You’ll have noticed that I have been doing a lot more yoga recently. It’s great when I work from home and am able to do a class in between conference calls. When I am in the office it can be a bit trickier though. Thanks to this collaboration with Furniture at Work I can share with you some great #OfficeYoga moves that you can fit in around your calls and meetings! Why is #OfficeYoga a good thing? Well it not only gives you a few calm moments to focus on you rather than your crazy workload, but stretching and unknotting your muscles unknots your muscles, increases blood flow and improves your focus…just in time for it to be dulled by your next conference call! To help us all get moving in the office the crew at Furniture at Work have put together this great infographic of some great yoga moves to help you get through the day. Unfortunately for me I have a stand-up desk and don’t have a chair to do the moves on, so I’ve been checking out these office chairs for when I feel like sitting down for a call, and doing some yoga whilst I nag people…. it’s all about multi-tasking when you’re a project manager! I definitely prefer the idea of Chair Eagle Pose over standard Eagle Pose though, I always find that pose a bit tricky. Attempting to be a standing, self-knotted, tangle always ends up in a bit of a struggle to stay upright. The team are also putting together a video to give you more ideas for #OfficeYoga, so why not subscribe to their YouTube Channel so you get notified when it is launched in the next fortnight. I can’t wait to see what other creative pose variations they come up with. 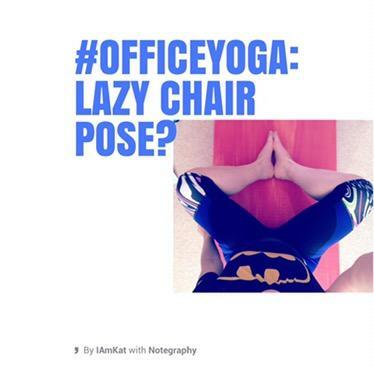 Don’t forget you can get involved in the #OfficeYoga conversation with them on Twitter, or Facebook…. why not give them a shout with your own suggestions! I’m trying to get creative and come up with a Pigeon Pose variation.